Tangled and True: sunscreen towlettes. 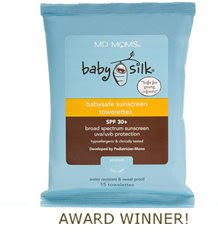 Baby Silk has simplified sunscreen and the result is good enough to make any mom happy. Kids love to be outside and I don't know how many times we've been at the park and had to cut playtime early because of the sun. WOW, this is the best idea EVER@ thanks so much!